The day dawned cool and hazy, which provided ideal running conditions, with 10 of the 14 runners beating their previous times and both most improved runners posting personal best times over the current course. 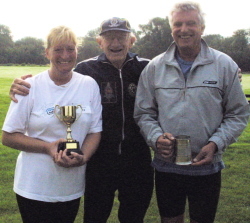 Congratulations to our most improved runners: Sandra Jones and John Scott. 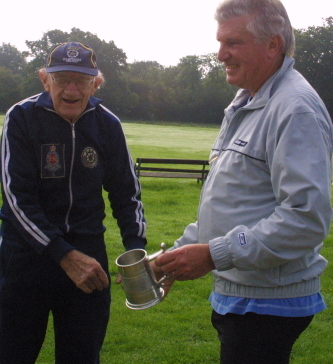 They were presented with the trophies by Jack Ellicock. Thanks very much to Jack and Fiona for officiating and manning the food stall, the Cricket Club for the venue and Longparish Community Association for funding new extra route signs for the runners. This month saw the revised handicap system in operation. A runner's handicap is calculated from her most recent race. Full credit is given for improvement, but a poor performance is penalized by a maximum of 30 seconds. This stops an unusually bad day presenting the 'most improved' award to the runner the following month.